The resolute people of this great city- Visakhapatnam. I am privileged to visit Visakhapatnam. The city has a special place in the heart of all Indians. My last visit to Vishakhapatnam was in October of 2014. At that time, Cyclone Hudhud had left the city shattered in pieces. But, the people of Vishakhapatnam smiled in the face of adversity. It is a tribute to the city that within 14 months, you have risen against all odds to welcome the Navies from across the continents in this International Fleet Review. A little over a year ago, we saw the full fury of the ocean. Today, thanks to the spirit of the people of Visakhapatnam, we are discussing how the oceans can be a source of economic prosperity for all of us. For its courage and resolve, we all salute the city of Visakhapatnam. My profuse thanks to the men and women of the Indian Navy for their tireless dedication for making this Fleet Review a truly historic success. My sincere gratitude also to Chief Minister Chandrababu Naiduji for his strong support for this international event. For me personally, witnessing the harmony among the best of International Navies here has been a rewarding experience. Just over three months earlier in October, we welcomed in Delhi, for the first time ever, all the 54 African nations, including over 40 Heads of State for the 3rd India-Africa Summit. A few weeks earlier in August 2015, India had hosted in Jaipur 14 Heads of the State for the Second Forum for India-Pacific Island Cooperation. Just day before yesterday, we welcomed all the SAARC countries for the 12th South Asian Games in Guwahati. And today it is our pleasure to welcome 50 foreign Navies from every corner of the globe at India's second International Fleet review- the first one on India's East Coast. Your participation is a message of cooperation and friendship that we deeply cherish. On behalf of my countrymen, I thank you all for accepting our invitation and joining in this event with such spirit. To build on the gains from today's gathering, India would host the first ever Global Maritime Summit in April this year. Its priority would be to scale up and strengthen the vibrant trade / investment / technology and commercial linkages between India and other maritime nations. The oceans and world’s waterways are global commons. Vasudhaiva Kutumbakam– the concept of whole world as a family – is perhaps most vividly witnessed on the oceans of the planet, that connect us all. The last time India hosted the International Fleet Review was in the year 2001, in the city of Mumbai. The world of 2016 is vastly different. Its politics is turbulent, and its challenges complex. At the same time, the oceans are the lifelines of global prosperity. They present us with great economic opportunities to build our nations. Over 90% of global merchandise trade is carried on the oceans. Over the last 15 years, its value has grown from about 6 trillion dollars to about 20 trillion dollars. Oceans are critical for the global energy security as over 60% of world’s oil production moves through sea routes. Our ability to reap economic benefits from the oceans rests on our capacity to respond to the challenges in the maritime domain. The threat of sea borne terror, of which India has been a direct victim, continues to endanger the regional and global peace and stability. Piracy too remains a strong challenge. The threat of natural disasters like tsunamis and cyclones is ever present. Manmade problems such as oil spills, climate change continue to risk the stability of the maritime domain. A peaceful and stable maritime environment is, therefore, critical for the regional and global security. It is also a must to harvest the riches of the oceanic ecosystems. Given the scale and complexity of modern day challenges, the international maritime stability cannot be the preserve of a single nation. It has to be a shared goal and responsibility of all the seafaring countries. To this end, the Navies and maritime agencies of the world need to work together, and engineer virtuous cycles of cooperation. But, where necessary, they also need to act to secure the international sea lanes of communication. • cooperate, not compete in responding to the challenges in the seas. The large presence of foreign Navies at this Fleet Review is a confirmation of our shared urge to walk the pathways of peace and cooperation to keep the maritime domain safe and secure. India is, and has always been, a maritime nation. India's ancient Sanskrit texts also refer to the oceans as the storehouse of Chaturdashanam Ratnanam, the 14 gems. Surrounded by sea from three sides, India has a long coastline of over 7500 kilometres. We have been blessed with a rich maritime heritage ever since .Lothal in Gujarat became one of the earliest sea ports of the world. India’s central location in the Indian Ocean has connected us with other cultures, shaped our maritime trade routes, influenced India’s strategic thought, and defined our maritime character. Since the days of the Indus Valley Civilization, India has maintained an extensive network of maritime links, including with Africa, Western Asia, the Mediterranean region, the West, South East Asia and the Far East. We are delighted that the Navies from all these regions have joined in this Fleet Review. The Photo Essay book on the ‘Maritime Heritage of India’, that I have just released, showcases this glorious maritime tradition. In moderntimes too, the oceans, especially the Indian Ocean, occupy a vital place in India’s national security and economic prosperity.The waters of the Indian Ocean touch the shores of over 40 countries. About half of world's container traffic; and close to one-third of world's cargo traffic passes through this region. 90% of our trade by volume and 90% of our oil imports are carried on the seas. India’s 1200 island territories, and our huge Exclusive Economic Zone of 2.4 million square kilometers makes clear the economic significance of the Indian Ocean. For us, it also serves as a strategic bridge with the nations in our immediate and extended maritime neighbourhood. In March last year, in Mauritius,I had spelt out our vision for the Indian Ocean. The Indian Ocean Region is one of my foremost policy priorities. Our approach is evident in our vision of “Sagar”, which means “Ocean” and stands for – Security And Growth for All in the Region. We would continue to actively pursue and promote our geo-political, strategic and economic interests on the seas, in particular the Indian Ocean. To this end, India's modern and multi-dimensional Navy leads from the front. It is a force for peace and good. A network of growing political and economic maritime partnerships, and strengthening of regional frameworksalso helps us pursue our goals. India’s quest for economic prosperity through oceans is a part of our larger efforts to transform India. We are not just a bright spot in the global economy. Regionally and internationally, we are a pillar of stability and an important growth centre. India's rise is in harmony with the goal of maintaining the regional and global peace and security. Within the country, there is great optimism, enthusiasm and a “can do” mindset. This optimism comes from the energy and enterprise of our confident youth. It also comes from our bold and sustained measures to transform our country, improve our laws, processes and institutions. We are launching new initiatives and creating opportunities to empower people, and give them a sense of ownership in nation's progress. “Make in India”, which has re-ignited our manufacturing sector is one such initiative. Defence manufacturing and ship building are among its focus areas. In a week from now, on 13 February, we would hold 7 days of global engagement under "Make in India" in Mumbai. During this time, the best in the global industry would link up with the innovation, design and manufacturing opportunities of India- the world's fastest growing economy. We want to invite the world to Make in India, Make for India, and Make for the World. We take pride in the fact that of all the Indian Naval ships participating in this Fleet Review, at least 37 are “Made in India” – a number that will surely rise in the coming years. Our “Skill India” program is building institutions that train, support, encourage and guide our 800 million youth on the path of entrepreneurship. Our skilled youth are ready to respond to the national and global manpower demands of the 21st century. 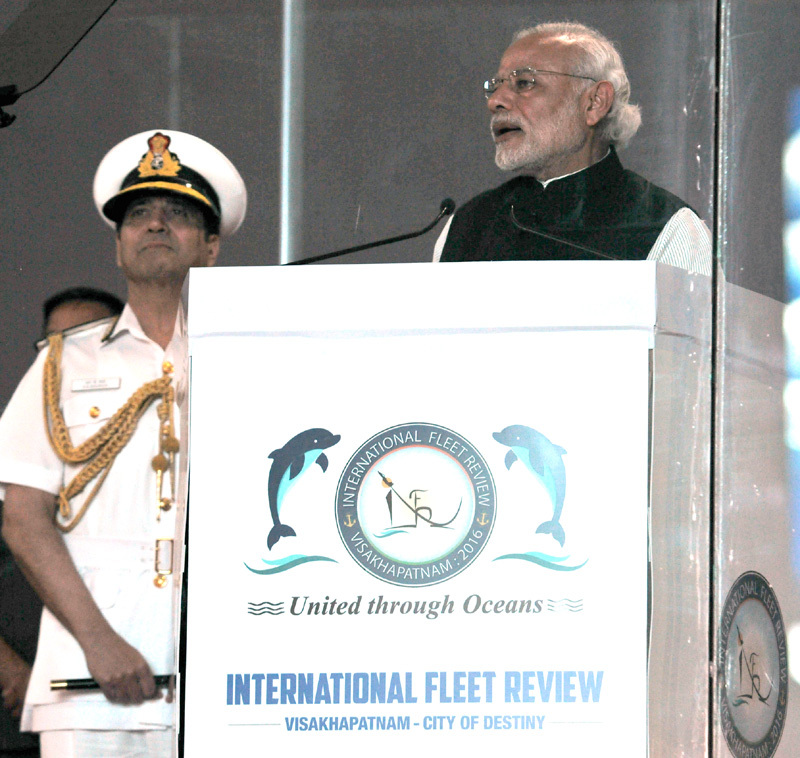 An important part of India’s transformation is my vision of “Blue Economy” in its widest sense. The Blue Chakra – or the wheel – in our National Flag, represents the potential of the Blue Economy. An essential part of this pursuit is the development of India's coastal and island territories: but, not just for tourism. We want to build new pillars of economic activity in the coastal areas and in linked hinterlands through sustainable tapping of oceanic resources. Strengthening our marine research, development of eco-friendly, marine industrial and technology base, and fisheries are other elements of our goal. In this endeavour, I see youth in the coastal areas as our true assets. They have a natural and deep understanding of the Oceans. They could lead the way in the development of blue economy in India. In partnership with all the coastal states of India, I want to shape a special program of skilling India's youth in the coastal areas of the country. In the end, let me once again congratulate the Indian Navy for the flawless conduct of this grand event. For the homeward journey of all our Naval friends from across the world, may you always have fair winds, following seas, and many a fathom below your keel. The Prime Minister, Shri Narendra Modi, today dedicated the state of the art Paradip Refinery in Odisha, to the nation. Addressing the large gathering on the occasion, the Prime Minister said he appreciated the participation of a such a large number of people in an official programme related to development. Remembering former Chief Minister of Odisha Shri Biju Patnaik, the Prime Minister said Paradip will now become “Vikas Dweep” – the island of development for the people of Odisha. He said youth would benefit from employment opportunities, and poor women across the country who depended on firewood for fuel, would get access to LPG. Shri Narendra Modi said Government initiatives such as Mudra and Start Up India are benefitting the youth of India. The Prime Minister, who visited the Main Control Room and the Indmax Unit built with indigenous technology, before arriving at the inauguration venue, said the Indmax production capabilities at the plant are an illustration of the Make in India initiative. The Prime Minister, Shri Narendra Modi, today dedicated to the nation, the National Institute of Science Education and Research at Bhubaneswar. The Prime Minister urged the students of NISER to work towards making NISER India's greenest campus, and a zero-emission, zero-discharge campus which uses only renewable energy.